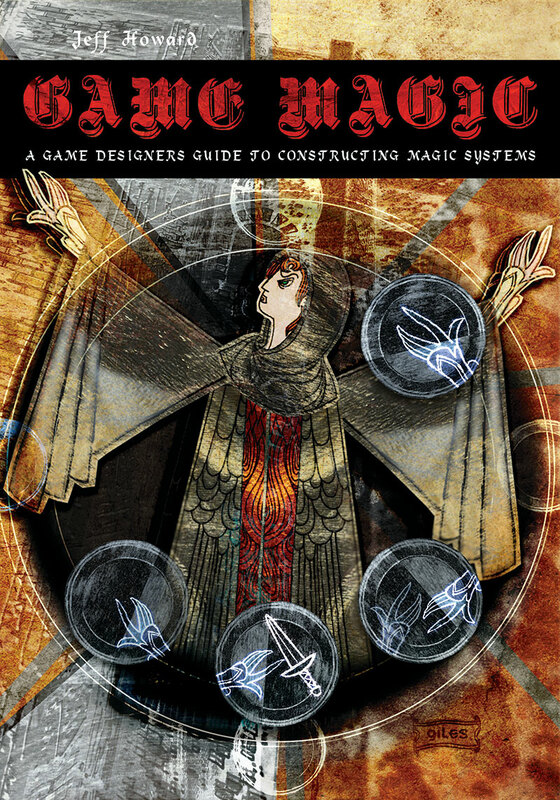 My book, Game Magic: A Game Designer’s Guide to Constructing Magic Systems, is forthcoming in April 2014. I submitted the manuscript on September 1st of this year, and it is now being copyedited and typeset. The book can be preordered at Amazon. The excellent cover art below is from Giles Timms, more of whose work can be seen here. One of the topics at the heart of my forthcoming book, Game Magic, is the underlying logical flow of a magic system. Developing a magic system requires the designer to be able to express precisely the sequence of processes that a player must perform to cast a spell. Does the player need ingredients to cast a spell? Do they perform gestures or recite incantations? Will the spell draw energy from a mana pool? What happens if the player overspends mana? 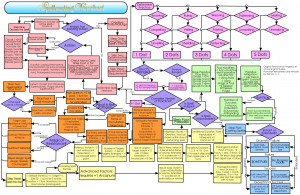 The answers to all of these questions can often be most effectively represented in a flow chart, which displays visually the branching logic, feedback loops, and input-output relationships of a complex system. 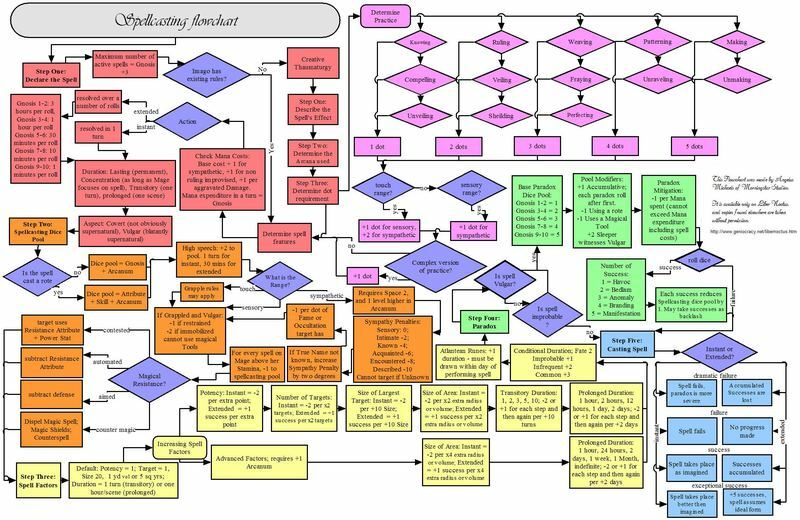 The two images below are excellent examples of flowcharts that clearly communicate the complex, sophisticated, and flexible logic of spellcasting in the tabletop role-playing game Mage: The Awakening (part of White Wolf’s World of Darkness universe). I would love to reproduce these charts in my book. The only problem is, I can’t find contact information for the charts’ creators. True to the mysterious universe of World of Darkness, these authors have disappeared in a labyrinth of dead links and untraceable aliases. Here are the clues that I have. A credit on the first chart reads, “This chart was created by Angelus Michaels of Morningstar Studios. It is available on Liber Noctus. and copies found elsewhere are taken without permission. www.geniocracy.net/libernotus.ht” Liber Noctus appears to have been a fan site for World of Darkness, but its host domain (geniocracy) now directs to a Raelian website. (The Raelians are a religion based on belief in UFO’s. While they are right at home in this trail of clues, they have nothing to do with the Mage chart. These are not the droids I’m looking for). Searches for Angelus Michaels and Morningstar Studios are equally fruitless, despite the intriguing Luciferian reference in Morningstar. The plot thickens with a second, remastered version of the chart. 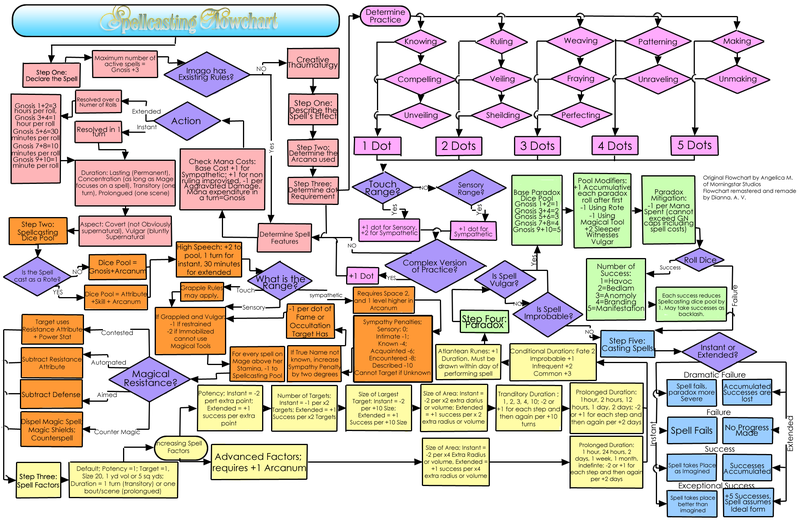 The credit on this version reads “Original Flowchart by Angelica M. of Morningstar Studios. Flowchart remastered and remade by Dianna. A.V.” The chart is visually crisper and easier to read, but the trail of its origins is murkier. Angelus Michaels has become Angelica M. The mysterious figure Dianna has been introduced, evoking echoes of Agent Dale Cooper’s tape recorder, followed by the abbreviation “A.V.” Are these the initials of a username or alias? A Latin abbreviation? An allusion to the WoD universe? I’m not sure. 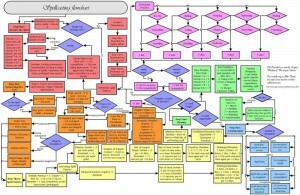 At any rate, I would love to use these flowcharts in my book. They are great illustrations of rigorously representing the logic of a complex magic system. But I don’t have contact information for either Angelus Michaels/Angelica M. or Dianna. There are a few forum threads that link to these charts, so I will continue to investigate through those channels, as well as doing more web research. But, if you are one of the creators of these charts, or you have an idea as to how they could be contacted, please post a comment and let me know. Thanks!